This post is part of the William Wyler Blogathon hosted by The Movie Projector, which runs June 24-29. You won’t want to miss it! 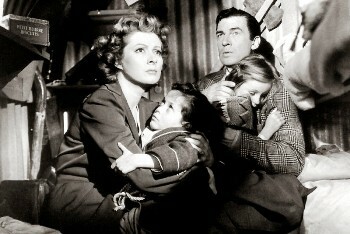 Greer Garson and Walter Pidgeon as the Minivers during The Blitz. Yes, Dear Reader, we can tell you’re in the mood for a Movie Of Influence; a film that may have Changed The Course Of History. Acclaimed director William Wyler used this movie to help persuade the American public to support World War II. Winston Churchill felt this movie positively affected the outcome of the war. The sermon delivered by the vicar at the movie’s conclusion was published in Time magazine and printed on leaflets dropped over Europe. You could argue that it was one of the most influential films during the second world war. Even Hollywood thought so; this movie received six Academy Awards, including Best Picture. The 1942 war film Mrs. Miniver, starring Greer Garson and Walter Pidgeon chronicles the life of a middle-class British family during the early days of WWII. The movie is based on a series of London newspaper columns by Jan Struther, which later became a book, then a Hollywood movie. Wyler is still regarded as one of the best directors Hollywood ever produced, and Mrs. Miniver is one example why. The film opens with the Minivers living a bucolic life in a quaint village in southern England. In the opening scenes we see Garson as Mrs. Miniver, buying a silly hat and then fretting about catching her train. Wyler uses scenes like this to impress upon us that the Minivers’ pre-war life is lovely and sweet, hardly touched by the cruelties of life. But it’s a set-up, all this cheery complacency. As the audience, we feel a little uneasy because we know that trouble’s brewin’ across the Channel. Greer Garson is almost a bit too glamourous for the role of an English housewife, but she still manages to be believable. Walter Pidgeon (with an American accent that is never explained) gives a charming performance as a man who greatly admires his wife. Clearly, this is Garson’s movie and Pidgeon seems comfortable with his role as “the husband”. Mrs. Miniver reminds us that ordinary people who overcome extraordinary circumstances are society’s heroes. During war, it is not always the generals or the admirals who win the battles. Wyler shows us that heroes are people with the courage and strength to grind through the tough business. They are the ones to be praised. Mrs. Miniver: starring Greer Garson, Walter Pidgeon, Teresa Wright. Written by Arthur Wimperis, Arthur Froeschel, James Hilton. Directed by William Wyler. Metro-Goldwyn-Mayer, B&W, 1942, 135 mins. Enjoyed your post on this beloved film. Garson and Pidgeon perform so well together here, it’s no wonder they were teamed 8 times. And thanks for the WW2 background info; fascinating! Garson and Pidgeon have good chemistry, don`t they? Thanks for dropping by! Great post on this classic. Have not seen it yet, but you have me anxious to get to it now. Glad to see ewe you’ve joined the LAMB as well. Welcome aboard! Thanks for your comments! So happy to be a member of LAMB. Hope you find the chance to see “Mrs. Miniver” – it’s worth it! This film has taken a lot of hits from critics and historians over the years, with some even suggesting that it’s Best Picture Oscar win is the worst decision on record. I am not among that fraternity, but neither can I regard myself as a big fan. But you make a stellar defense here, and there are many aspects of the film to admire, including the performances, Joseph Ruttenberg’s lovely cinematography and the fine score from Herbert Stothart. In any case Wyler’s real intentions achieved success behind the camera and in the propaganda mill. Thanks for pointing out J. Ruttenberg’s terrific cinematography and H. Stothart’s score. The movie would not be the same without them. Nice to put this movie in context with the war effort. It is a swell film (and yes, Greer was almost always too glamorous. I think she woke up that way). it is moving, inspiring and, of course, Wyler pulls all the right heart strings. Lovely post! LOL – Greer woke up that way!! I think you’re right! Interesting thoughts on how influencial this film was to the war effort. I have not since this film since I was a kid when my parents loved it and would watch it everytime it was on. Since I was only 11 or 12 years old at the time, and with only one TV in the house, I had little choice. Admittedly at that age this was not my kind of film. I should give it another try after all these years. Enjoyed! Oh yes, try to see it again when you have the chance. It may not end up on your list of favourites, but there are lots of things to admire about it. I have a close friend who lost her brother (Canadian Navy) during the war and, for her, “Mrs. Miniver” the film holds a very dear place in her heart. For me, the lessons of striving and sacrifice plus the appealing performances are ever touching. Thanks for your comments. You’ve made a good point about the tragic sacrifices in war, and those who are left behind to grieve. I like the way you place the film in the context of the events of its time and emphasize its theme of ordinary people being swept up in situations of historical import. It is a film that was unabashedly calculated to stir the emotions of its audience and create awareness of the terrible things happening in Britain in the early days of the war and create a feeling of solidarity with the British. It has sequences that are still powerful and show how skilled a director Wyler was, especially at bringing out the emotional essence of things happening on the screen. 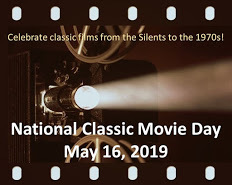 The mobilizing of the boats for the evacuation of Dunkirk, the night in the bomb shelter (which you picture at the beginning of the post), the sequence where Greer Garson and Teresa Wright get caught in an air raid–all these are very affecting. Greer Garson was hugely popular in the 40s, but I’ve never much warmed to her. Here she does seem very low-key and honest, though, the kind of middle-class Englishwoman whose life is very easy to appreciate and whose simple courage is easy to admire. She was a bit young for her role, but I kept telling myself that Mrs. Miniver married right out of school and looked youthful for her age. (She got the role after Norma Shearer, only eight years older than Garson, turned it down, not wanting to play the mother of a son in college. Big mistake. She might have revived her career and gotten another Oscar. I think with her ladylike persona she would have been good in the part.) Interesting you should mention Walter Pidgeon’s accent. I kept listening for some clue that maybe his character was Canadian (which Pidgeon actually was) to explain it. Thanks for your contribution to the Wyler blogathon. Given the divided feelings of modern viewers over the film, it’s not an easy one to write on, and you did an admirable job. Thanks for dropping by and for your kind comments. Norma, Norma, Norma! She would have done a wonderful job and – I think you’re right – gotten another Oscar in the process. I think Wyler did a fine job with this film – and I do like Garson as Mrs Miniver, even though she is rather glamorous, as you say.The pre-war life is rather too idyllic and unbelievable, but the film deepens when war comes, and for me the highlight is the powerful scene where Garson is alone with the German airman in her kitchen. Enjoyed your review, and I was very interested to learn about the sermon being printed on leaflets dropped over Europe! Oh yeah, the scene with G. Garson in the kitchen with the German airman is terrific! I could watch that scene all day. I love this film, no matter how others think of it. You do have to see it within a historical context, which you provide nicely. The bomb shelter scene is so perfectly constructed, and the looks on Garson’s and Pidgeon’s faces are worth any lines of dialogue — thank you Mr. Wyler for that. I think in any other director’s hands this story would have been too syrupy. Garson did create a bit of s stir when when she had an affair — and married — Richard Ney, who plays her oldest son in the movie! Yes, the affair with Richard Ney is rather juicy. I really try to not think about it when watching the movie. Thanks for dropping by! I love Mrs. Miniver. Ah, don’t be so dismissive of the 1940s middle-class English housewife–some were glamorous, just ask my grandmum. LOL! This was n important film for its time. I enjoyed reading your post. Thanks, Kim. And yes, now that I think about it, the 1940s housewives were a bit of a glamorous bunch. My grandmother was one, too! I saw this movie for the first time about two years ago and I was blown away by how great it was. It was the movie the introduced me to Teresa Wright, and I can’t believe how good she is. This movie hit me hard and I finished it trying to understand how this movie has managed to fly under the radar these days. I think it is one of the best movies to come out of the 1940’s. I actually bought a bunch of copies and handed them out as christmas presents last year. If it is possible, I also found myself loving Henry Travers more than I thought possible. His character was deeply touching and I will remember his performance forever. You are so right about Teresa W. Shse is fabulous in this movie – and in every role she’s taken on. I love your idea of giving these movies out as presents… I might steal that idea. And Henry Travers – isn’t he a gem? He is just adorable in this movie. It took some time, but “Mrs. Miniver” has grown on me. For years I dismissed it as too melodramatic (which is how Greer Garson tends to strike me most of the time). William Wyler, as ever, has constructed, staged and filmed artfully – but it is the ensemble of characters and one or two performances in particular that hooked me. Teresa Wright is nothing less than luminous as Carol and I’ve never been able to resist Henry Travers in anything – he was never more endearing than he is here as humble Mr. Ballard. Where I once considered “Mrs. Miniver” sentimental I now think of it as touching and lovely. Very nice post. Thanks for dropping by, Lady Eve. Yes, Teresa W. and Henry T. are really terrific in this movie. I can’t think of anyone better. Mrs. Miniver in my opinion is one of the most well-done films depicting the effects of WWII on a more personal and family oriented level! You have the love Garson in this role! I LOVED your closing statements about who heroes can be….so true! Once again a fabulous post!!!! Thanks for your kind words. Mrs. Miniver is such a great film, isn’t it? It’s impossible to only watch part of it – you have to watch the whole thing! Enjoyed your post — I don’t know why I never knew that William Wyler directed this film! I also feel like I’ve never, for some odd reason, seen the movie from start to finish but, rather, pieces of it here and there. I will have to give it a proper viewing one of these days. That’s the great thing about Wyler, hey? He lets the story do the talking instead of drawing attention to himself.